Co-authors Izaac Trpeski and Megan Rullis have completed their daunting yet enviable challenge to travel Australia-wide in search of the best coffee and cafés that our country has to offer. 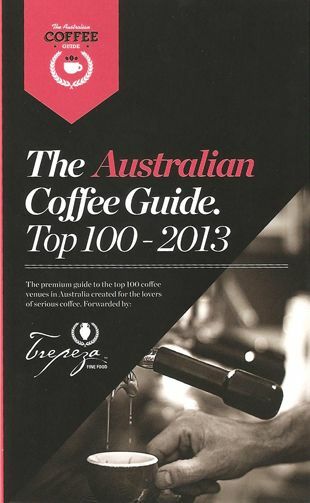 Presented by Trepeza Fine Food, The Australian Coffee Guide Top 100 – 2013 is a 60 page, pocket-sized book which highlights their favourite establishments to find the best cups of coffee and delicious food. You’ll find a lot of information about the Guide on its very own Facebook page. There are more pages devoted to NSW but all states are mentioned and any SoS reader will notice a few familiar names as they flip through. It’s a great companion to take on your travels so you will always know where to find a tasty hot beverage! Each entry features a brief description of the café (often including the brand of coffee used) and contact details. Not bad for the measly price of $8 and $2 postage. You can purchase the Guide online. While Sydney on Sunday did not contribute to The Australian Coffee Guide, I’m sure my like-minded readers will value its contents!